Llanrhos’s St Mary’s Well ( Ffynnnon Fair) lies within about 100 yards of St Hilary’s Parish Church, Llanrhos, which is easily missed these days as you drive up the A470 into Llandudno. Llanrhos is a small community bordering Llandudno and Deganwy. St Hilary’s church itself is a mid Victorian building, which occupies the site of an earlier thirteenth century church. The first church on the site is said to date from the time of Maelgwn, King of Gwynedd, who flourished in the sixth century, having a stronghold close to Deganwy. There is a legend is that he took refuge in that church to avoid a yellow fever epidemic that was then afflicting the country. 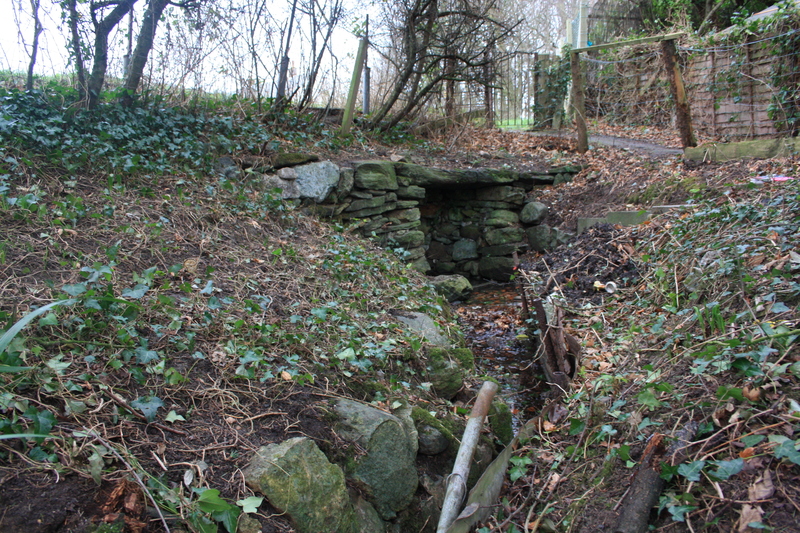 The well is beside a footpath that runs from a mid twentieth century housing estate, past a children’s playground and to the old school and the parish church on the busy B5115. 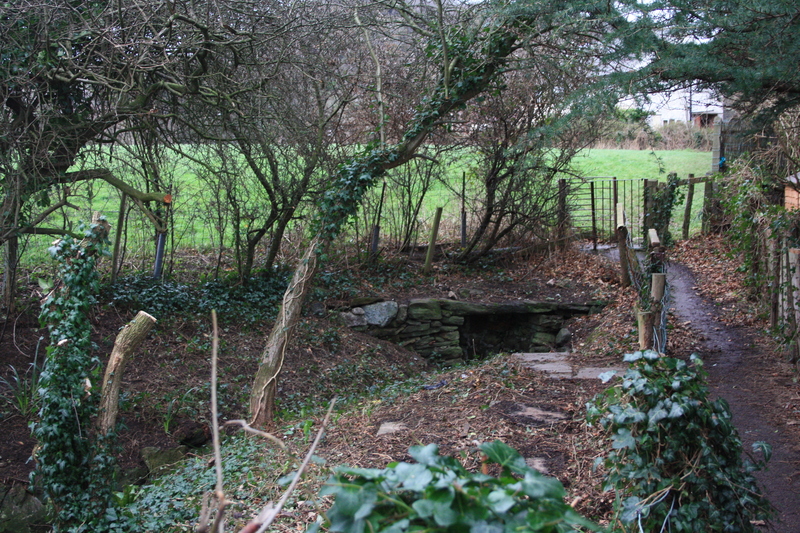 The well is accessed via concrete steps leading down from footpath, and is enclosed within a small landscaped area. 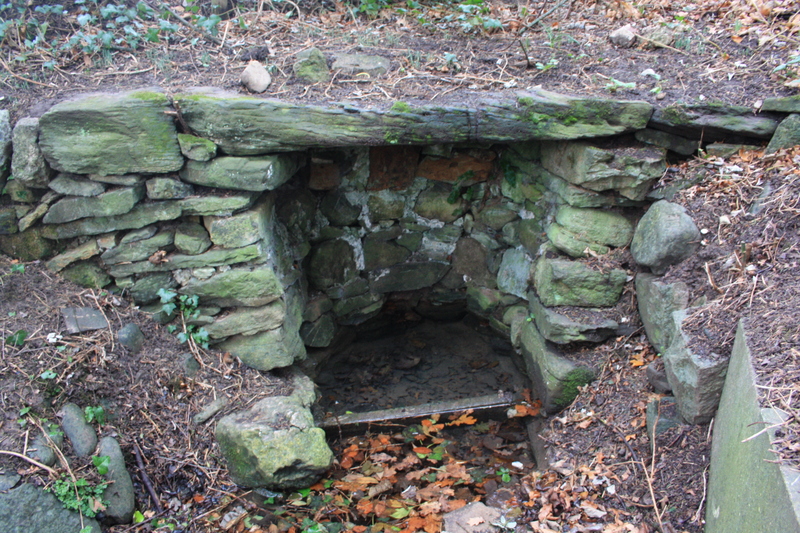 The water rises in a semi circular roofed stone basin, the water in the well has a depth of around 12 inches. It flows away in a small stone edged channel for around 15 yards before it joins with a drainage stream and is channelled away again underground. All this is due to the work of Ken Davies, who identified the location of the old well in the early 1990s, and since then has worked to restore the well and landscape the surrounding area. The account of this work is best described in Mr Davies own words, which can be found here (in English) and here (in Welsh). Mr Davies restored the well while living in a house only yards from the well. We did try to visit him when we visited the well, but, sadly, no one seemed to be at home on that occasion.